Last week Kamenendo, bum crane and I headed off on one of our little missions to see Julie Shepherd’s solo show out at Redlands Gallery. Julie must be one of the most prolific and patient potters I know. The gallery was brimful of her intricate and delicate pierced pieces, from teeny tiny sculptures through to larger (but no less delicate) forms. It was really quite mind blowing trying to comprehend the amount of work that had gone into the show! And as if that wasn't enough, I peeked into the other gallery to discover CURIO, one of the most engaging jewellery exhibitions I have seen in a while. It was curated by Kellee Uhr and included the work of Zoe Jay Veness, Anna Varendorff, Bibi Locke, Eleisha Nylund, Emily Bullock, Liana Kabel and Madelaine Brown. I have a strange relationship with jewellery. I very rarely wear it and yet I am so drawn to it and have a deep appreciation for it. I admire and am fascinated by the ingenious and multi-faceted approaches that jewellers use in their craft, the diversity of materials they use and the clever ways in which they use them. From Liana Kabel’s rubber necklaces (below) displayed very strikingly across a wall, through to Zoe Jay Veness’ incredible intricate paper ‘brooches’ (above left), this show really had it all. 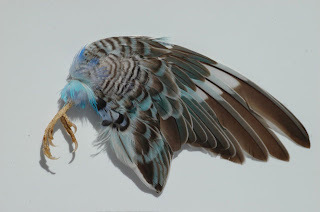 Emily Bullocks Lucky Claw brooches (below), made from the wings of budgies and rosellas, were beautiful, horrifying, amusing and disturbing all at the same time! 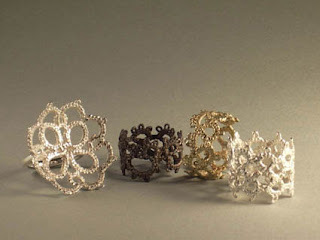 I also really enjoyed Madelaine Brown’s Frivolite series (below), rings cast in silver and gold from handmade lace. Love a good bit of tatting I do!! So all in all a very inspiring mission, topped off with our usual pillaging of the local bakeries and op shops.